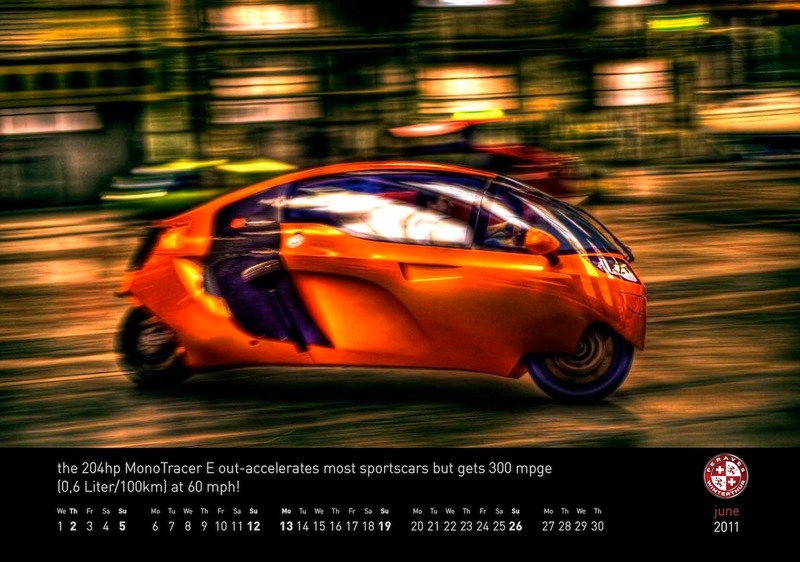 Behold the candy colored 2011 MonoTracer calendar as envisioned by Friedemann Lätsch. I’ve parsed the calendar into JPEGs viewable below. Click the jump if you’re viewing this from the main blog feed to see each JPEG individually. 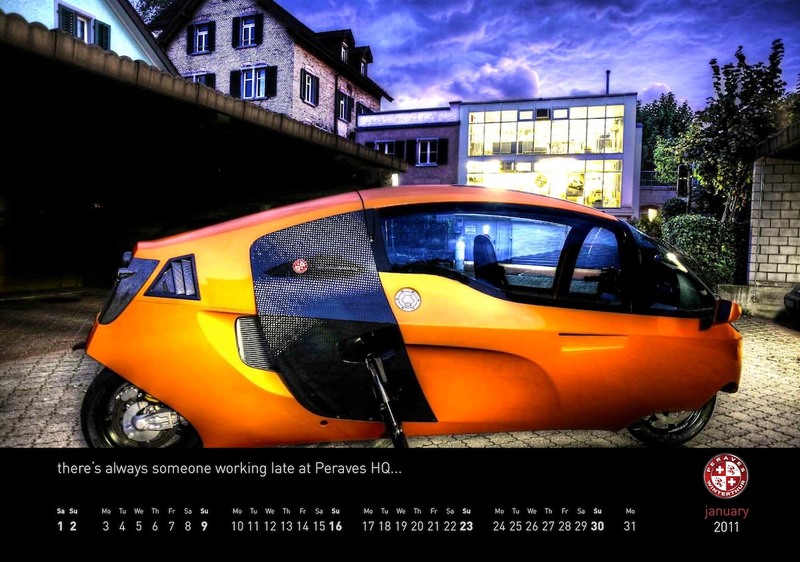 A low resolution (3.4Mb) PDF version of the 2011 MonoTracer of Switzerland Calendar is available by clicking here. 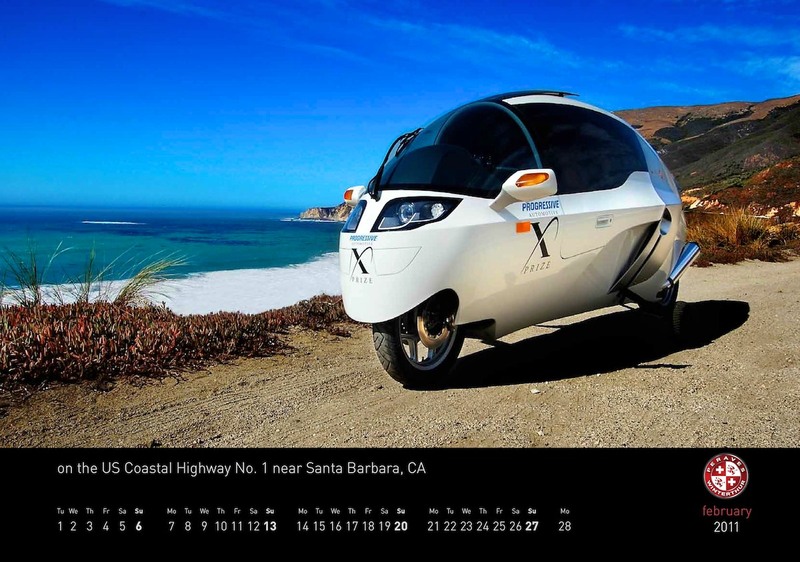 February 2011 MonoTracer of Switzerland Calendar – on the US Coastal highway No. 1 near Santa Barbara, CA. 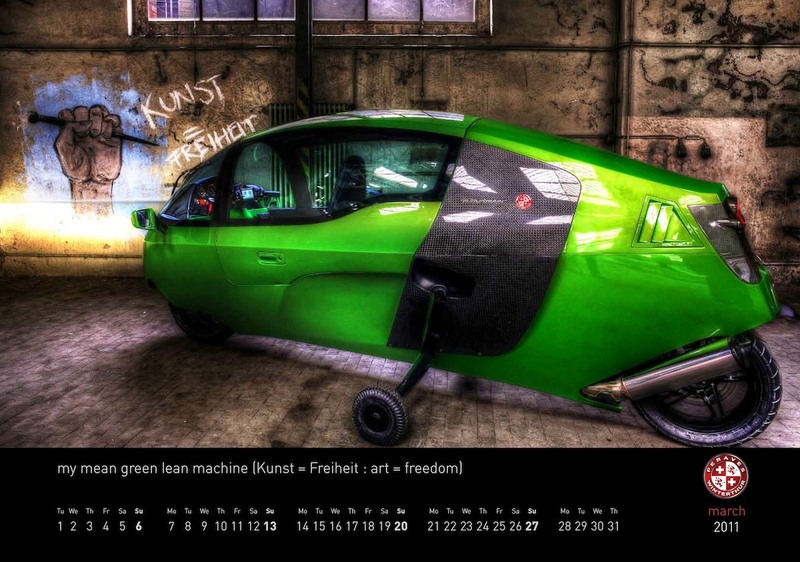 March 2011 MonoTracer of Switzerland Calendar – my mean green lean machine (Kunst = Freiheit : art = freedom). 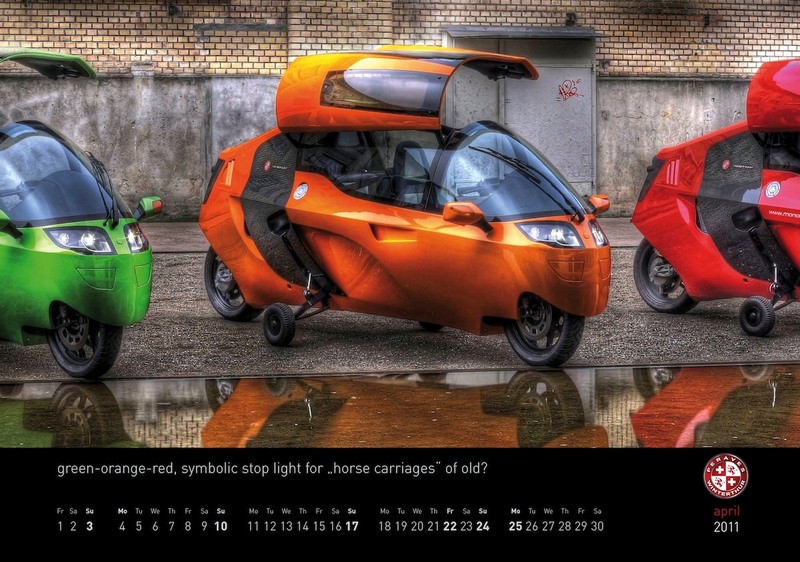 April 2011 MonoTracer of Switzerland Calendar – green-orange-red, symbolic stop light for “horse carriages” of old? 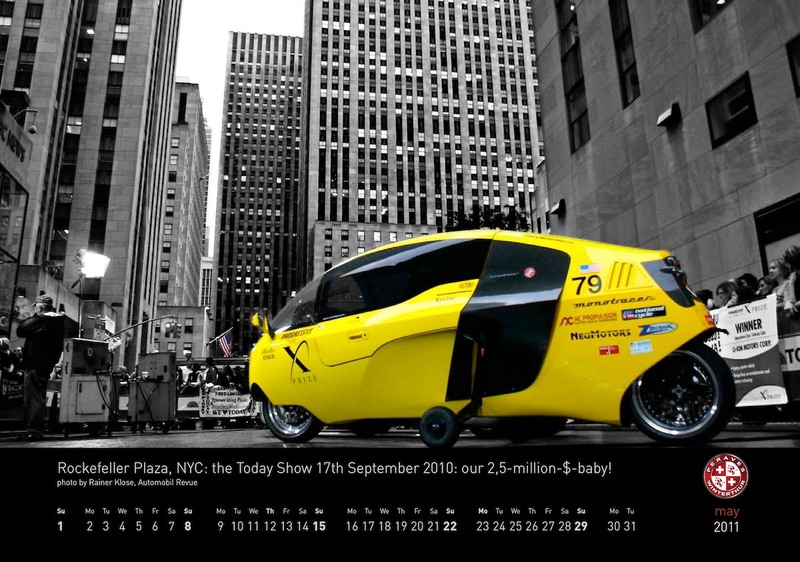 May 2011 MonoTracer of Switzerland Calendar – Rockefeller Plaza, NYC: the Today Show 17th September 2010: our 2,5-million-$-baby! 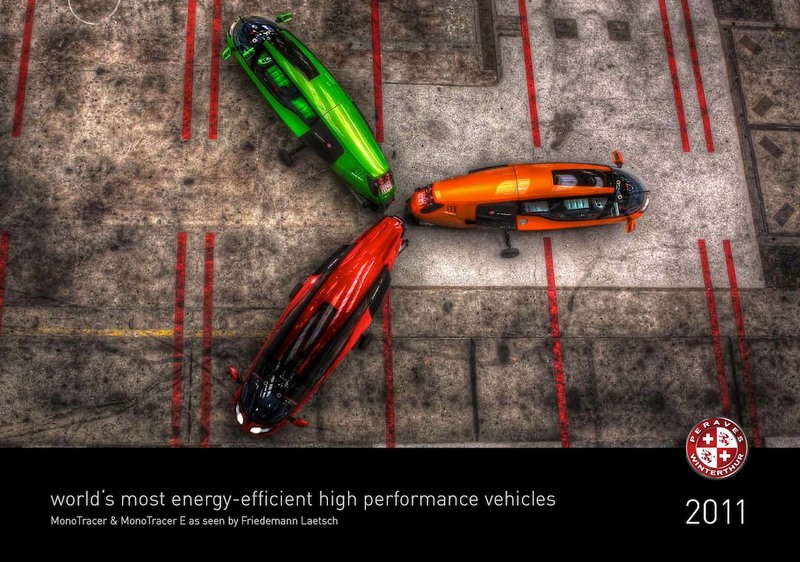 June 2011 MonoTracer of Switzerland Calendar – the 204hp MonoTracer E out-accelerates most sportscars but gets 300 mpge (0,6 Liter/100km) at 60mph! 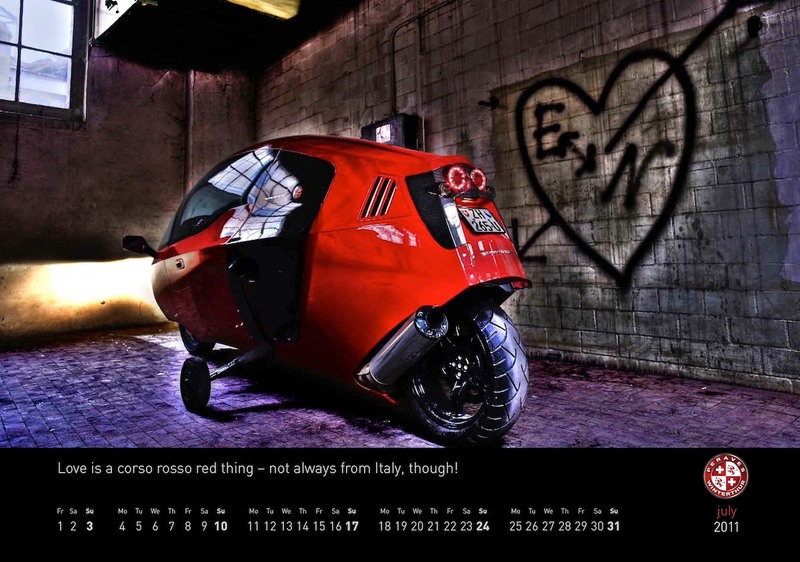 July 2011 MonoTracer of Switzerland Calendar – Love is a corso rossa red thing – not always from Italy, though! 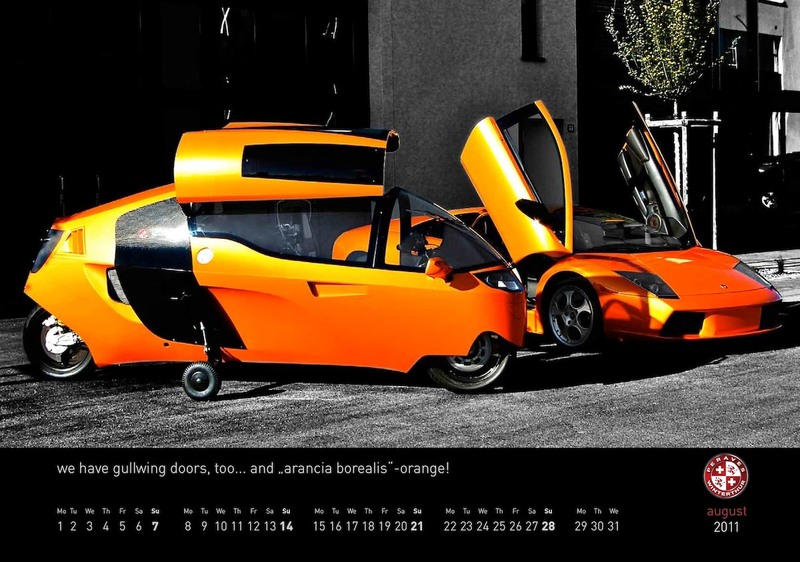 August 2011 MonoTracer of Switzerland Calendar – we have gullwing doors, too… and “arancia borealis” -orange! 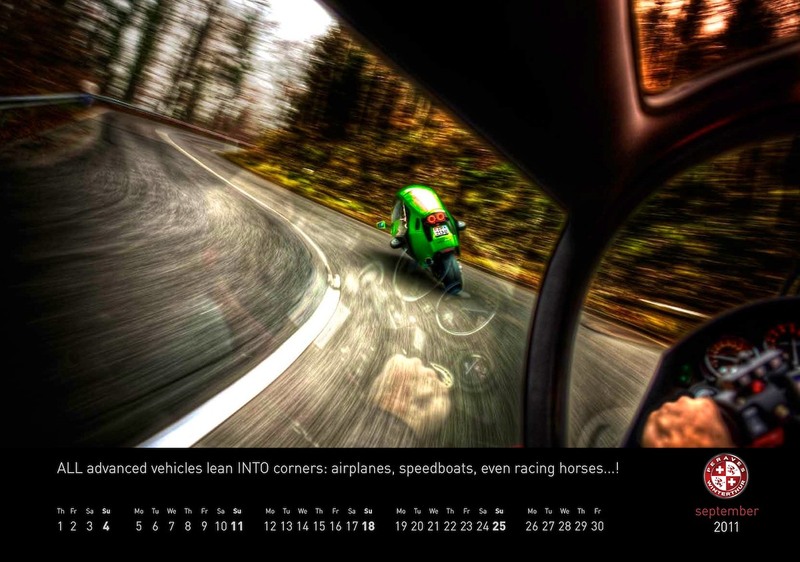 September 2011 MonoTracer of Switzerland Calendar – ALL advanced vehicles lean INTO corners: airplanes, speedboats, even racing horses…! 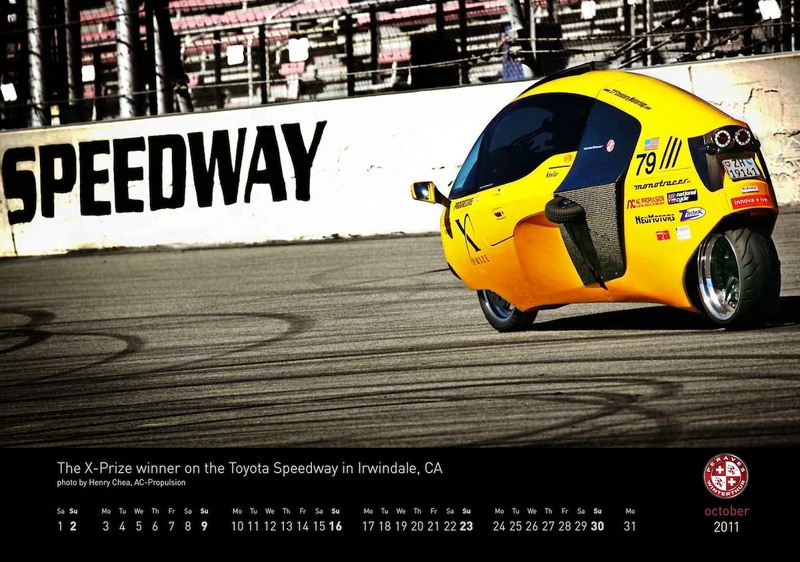 October 2011 MonoTracer of Switzerland Calendar – The X-Prize winner on the Toyota Speedway in Irwindale, CA. 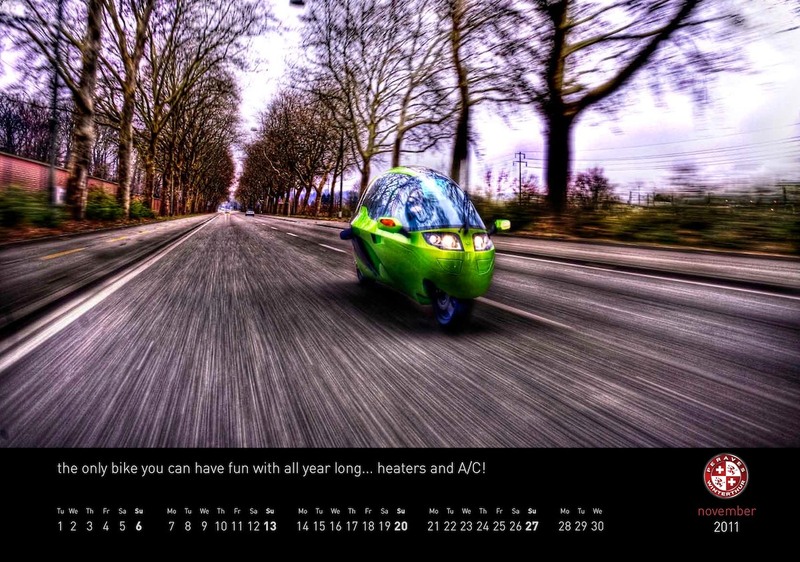 November 2011 MonoTracer of Switzerland Calendar – the only bike you can have fun with all year long… heaters and A/C! 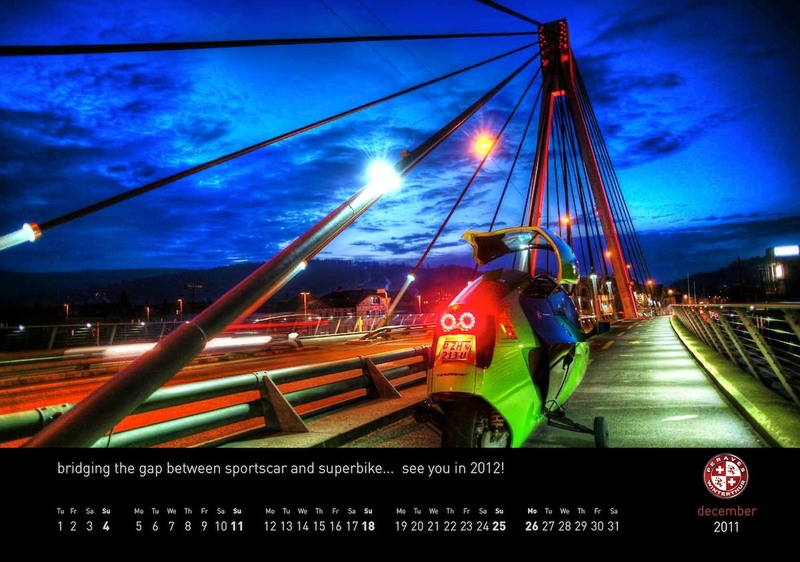 December 2011 MonoTracer of Switzerland Calendar – bridging the gap between sportscars and superbike… see you in 2012! This entry was posted in Peraves and tagged 2011 Bike Calendar, 2011 Calendar, 2011 MonoTracer Calendar, 2011 Motorcycle Calendar, CA, E-Tracer, green machine, gullwing doors, Lamborghini, lean, MonoTracer MTE-150, NYC, Peraves HQ, Rockefeller Plaza, Santa Barbara, The Today Show, Toyota Speedway at Irwindale, US Highway 1, X-PRIZE Winning X-Tracer. Bookmark the permalink.